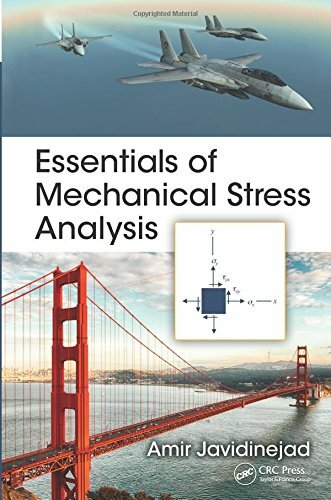 [PDF] Essentials of Mechanical Stress Analysis (Mechanical and Aerospace Engineering Series) | Free eBooks Download - EBOOKEE! Posted on 2017-11-19, by luongquocchinh. Description: Developed with stress analysts handling multidisciplinary subjects in mind, and written to provide the theories needed for problem solving and stress analysis on structural systems, Essentials of Mechanical Stress Analysis presents a variety of relevant topicsâ€”normally offered as individual course topicsâ€”that are crucial for carrying out the analysis of structures. This work explores concepts through both theory and numerical examples, and covers the analytical and numerical approaches to stress analysis, as well as isotropic, metallic, and orthotropic composite material analyses. Comprised of 13 chapters, this must-have resource: Establishes the fundamentals of material behavior required for understanding the concepts of stress analysis Defines stress and strain, and elaborates on the basic concepts exposing the relationship between the two Discusses topics related to contact stresses and pressure vessels Introduces the different failure criteria and margins of safety calculations for ductile and brittle materials Illustrates beam analysis theory under various types of loading Introduces plate analysis theory Addresses elastic instability and the buckling of columns and plates Demonstrates the concept of fatigue and stress to life-cycle calculations Explores the application of energy methods for determining deflection and stresses of structural systems Highlights the numerical methods and finite element techniques most commonly used for the calculation of stress Presents stress analysis methods for composite laminates Explains fastener and joint connection analysis theory Provides MathCADÂ® sample simulation codes that can be used for fast and reliable stress analysis Essentials of Mechanical Stress Analysis is a quintessential guide detailing topics related to stress and structural analysis for practicing stress analysts in mechanical, aerospace, civil, and materials engineering fields and serves as a reference for higher-level undergraduates and graduate students. No comments for "[PDF] Essentials of Mechanical Stress Analysis (Mechanical and Aerospace Engineering Series)".